We’d love your help. Let us know what’s wrong with this preview of Some Assembly Required by Anne Lamott. 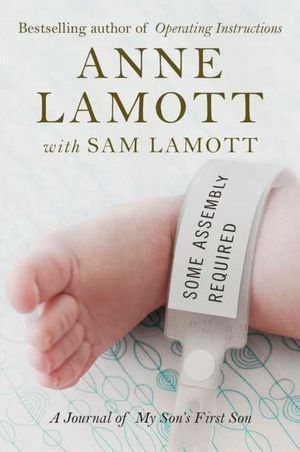 In Some Assembly Required, Anne Lamott enters a new and unexpected chapter of her own life: grandmotherhood. Stunned to learn that her son, Sam, is about to become a father at nineteen, Lamott begins a journal about the first year of her grandson Jax's life. 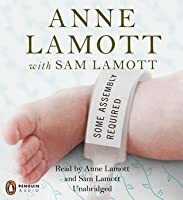 In careful and often hilarious detail, Lamott and Sam-about whom she first wrote so movingly in Operating Instructions-struggle to balance their changing roles with the demands of college and work, as they both forge new relationships with Jax's mother, who has her own ideas about how to raise a child. Lamott writes about the complex feelings that Jax fosters in her, recalling her own experiences with Sam when she was a single mother. Over the course of the year, the rhythms of life, death, family, and friends unfold in surprising and joyful ways. By turns poignant and funny, honest and touching, Some Assembly Required is the true story of how the birth of a baby changes a family-as this book will change everyone who reads it. In the end, it's really all about her. Okay, I get it: it's a memoir. I hate it when I have nothing nice to say about a memoir, because I feel like I'm being mean to the actual people IN the memoir, and three of the main characters in this memoir are very young: Lamott's son Sam, Sam's girfriend Amy, and their little boy. Lamott's memoir is subtitled "A Journal of My Son's First Son," but irritatingly, it is hardly that; rather it is a journal of a weirdly self-absorbed and controlling grandmothe In the end, it's really all about her. Okay, I get it: it's a memoir. I hate it when I have nothing nice to say about a memoir, because I feel like I'm being mean to the actual people IN the memoir, and three of the main characters in this memoir are very young: Lamott's son Sam, Sam's girfriend Amy, and their little boy. Lamott's memoir is subtitled "A Journal of My Son's First Son," but irritatingly, it is hardly that; rather it is a journal of a weirdly self-absorbed and controlling grandmother and her rather phony-sounding attitudes toward the younger three members of her family. I kept getting the impression that Lamott was saying to herself, "Okay, now, must maintain a relationship with Amy - time to say something nice even though she is making my life hell." Or attitudes to that effect: falseness was the keynote of this memoir. I have read and enjoyed Lamott's previous work and it surprised me immeasurably to discover how much I was NOT enjoying this one. The only thing I can attribute this difference to is that, in her spiritual writing, Lamott is all about the ideas; this time, it really did seem to be all about herself - and this time, I just didn't like her. I won this book as an Advance Reader Copy on Goodreads. Thank you for the opportunity. I really, really wanted to like this book. I read Anne Lamott's earlier book, Operating Instructions, and loved it. It was a raw, intimate tale of a woman raising a child on her own, and the community she built around her. It was a messy, honest account of Lamott's own, personal story. Some Assembly Required, on the other hand, feels like Lamott is telling someone else's story. Her 19-year old son and his girlfr I won this book as an Advance Reader Copy on Goodreads. Thank you for the opportunity. Some Assembly Required, on the other hand, feels like Lamott is telling someone else's story. Her 19-year old son and his girlfriend have a baby. Lamott's role in the story seems to be to complain: They are at her house too much; they aren't over to her house enough; her grandchild's mother isn't doing anything right, but isn't Lamott wonderful for not saying so. You know who Anne Lamott is, she’s that great great aunt who had a tiny but bright blip in your life and she opened some windows, taught you a few things and made you look at dreadlocks differently. But here it is, almost Christmas, and you know it’s time to make that annual drive to her house, a museum of eccentricities with two too-many animals and ugh, the dread. Two hours in the car and this intrusion in a day -- where really you didn’t have any other plans -- is heavy. Before you even twist You know who Anne Lamott is, she’s that great great aunt who had a tiny but bright blip in your life and she opened some windows, taught you a few things and made you look at dreadlocks differently. But here it is, almost Christmas, and you know it’s time to make that annual drive to her house, a museum of eccentricities with two too-many animals and ugh, the dread. Two hours in the car and this intrusion in a day -- where really you didn’t have any other plans -- is heavy. Before you even twist the dial to public radio, stick the straw in the Big Gulp, you pretty much hate Great Great Aunt Anne Lamott and you’re already doing the math on how long you have to stay to be polite without being there so long that you feel like emptying her medicine cabinet into your throat. Then you get there and … it’s not bad at all. In fact, it’s pleasant and a little funny. It’s warm and fuzzy and she hasn’t changed a bit. Still neurotic, still seeking solace in a village of friends she keeps on speed dial, still deferring to a higher power and still with the dreadlocks. So you stick around longer than you thought you would and give her a big hug when you leave and promise to call or at least email and think nice thoughts about her in the car the whole way home. And then next Christmas, another blood boiling stew over this looming visit, this intrusion on your life. You tell yourself that after this visit you certainly deserve ice cream with the works, that’s the carrot you’re dangling over the trip and … That’s who Anne Lamott is. Except instead of the long drive and the visit, it’s a new book. Longtime followers of Lamott will not be surprised by how this year unfolds: A lava of love and affection, serious freak outs that young Jax will die or that his mother Amy will decide to move from San Francisco and closer to family and friends in Chicago, freak out phone fests with her friends about handle communication hiccups and the chunks she takes out of her tongue as she reminds herself to back off, this is their life, she can’t control this dewy new family. The story is divided like a journal and also includes a trip to India, a trip to Europe, a wedding and a funeral, as well as mini interviews with Sam about Jax’s maturation as well as his own feelings on watching this mini ball of hilarity, this laid back baby, this young observer figure out how things work. It is also about as honest as Lamott could possibly be and she never soft-shoes her way around a beef with Amy or her suspicions that Sam needs to check himself or that she, herself, is on the cusp of overstepping or erupting in jealousy. I have been a fan of Lamott for more than 15 years, still I had a hard time actually picking this one up, opening it and pushing my eyeballs to the page. I just wasn’t in the mood for what I knew this book would be. You can, after all, like Anne Lamott -- or anyone really -- and still duck behind the organic junk food aisle when you see her coming. Still, once I picked it up I jammed through it pretty quickly and fell back into her groove. This book isn’t going to set any land speed records. It’s not new or different. The writing is standard Lamott fare, which is always pleasant and conversational and she’s got a unique perspective. Basically, Lamott is and always has been a pre-Blogger blogger, chronicling her life in book form. (Which, I guess makes Sam Lamott the OG Leta Armstrong). She’s charming and a little crazy and regularly learning a valuable new life lesson or relearning an old one. And Sam has become this arty, sensitive, spiritual, open-minded, mature kid who might tell his mother that her jeans have past their expiration date, but will also list for her the qualities she has bestowed on to him that he is especially grateful for. For old fans of the family, you’ll like what they’ve been up to. This book does a lovely job highlighting the dazzling selfishness of grandparents, god love them. This is a phenomenon that I've had ample opportunity to witness firsthand since the birth of my kid. In Lamott's case, she may have slightly more reason to be overbearing since her son was 19 when his kid Jax was born, but that still doesn't entirely excuse her. She has an extremely hard time letting the child's parents, otherwise known as not her, call the shots. At times it gets painful to read ab This book does a lovely job highlighting the dazzling selfishness of grandparents, god love them. This is a phenomenon that I've had ample opportunity to witness firsthand since the birth of my kid. In Lamott's case, she may have slightly more reason to be overbearing since her son was 19 when his kid Jax was born, but that still doesn't entirely excuse her. She has an extremely hard time letting the child's parents, otherwise known as not her, call the shots. At times it gets painful to read about what a control freak she can be regarding her grandson. I'd like Amy, Jax's mom, to write a book with her side of things, although I guess it would basically read, "Today Annie tried to tell me what to do about Jax, again." I love my in-laws to death & that's given me the wherewithal to step back & try to see things from their perspective, even when they're driving me nuts. It's got to be supremely difficult for the parent of an adult to see a baby born & realise that this new person has very little to do with them and everything to do with its actual parents. Grandparents want to meddle & tell you what to do because they see this new little person & they feel like life is passing them by. They've been the Mom or Dad for so long, it's hard for them to see that there's a new Mom or Dad in town, and although these new parents may not feel like it at the time, they are the experts on this baby. After G was born, I was running on nothing but instinct and hormones & I felt more like an animal than a person, so woe betide anyone who tried to boss me in regards to that baby (but that's just me). But I get this & I fully expect to have a problem with meddling when and if my kid makes me a grandma. Personal perspective aside, this is an okay book with some repetitive insights about spirituality & religion, babies, & all that circle of life stuff. You know, I think I'm just not in the right life space for Anne Lamott. I've enjoyed her nonfiction books in the past (her fiction doesn't really do it for me), but I found myself skimming a lot of this book with a sense of irritation. Right now, in my life, there is a lot that needs to get done. And Anne is all take a walk, have a thought, call a friend, take a nap. Sometimes she mixes up the order, and sometimes she does a few of these things simultaneously. Sometimes she throws in going to ch You know, I think I'm just not in the right life space for Anne Lamott. I've enjoyed her nonfiction books in the past (her fiction doesn't really do it for me), but I found myself skimming a lot of this book with a sense of irritation. Right now, in my life, there is a lot that needs to get done. And Anne is all take a walk, have a thought, call a friend, take a nap. Sometimes she mixes up the order, and sometimes she does a few of these things simultaneously. Sometimes she throws in going to church or some other worship service; but otherwise the whole book is walk, talk, think, sleep. It's just like real life, but absent the do. I mean, she writes I guess, because I'm reading her book. And she goes places, so that she can walk, talk, and think someplace different. I don't know exactly what I'm expecting from her, maybe some level of engagement with the world? She does adore her family and her writing is wonderful. However, I felt like I was stuck in an elevator with Debbie Downer. I’ve been following Anne Lamott’s life since she had her son and published Operating Instructions, a book about all the struggles and difficulties and amazing experiences she had as a single mother. I followed Lamott through Bird by Bird, a book that is sold as a writing instruction manual, but that is really more of Anne Lamott’s life. I pursued Lamott through Traveling Mercies, a book about her unexpected dive into Christian spirituality, and continued through Plan B and Grace (Eventually), a I’ve been following Anne Lamott’s life since she had her son and published Operating Instructions, a book about all the struggles and difficulties and amazing experiences she had as a single mother. I followed Lamott through Bird by Bird, a book that is sold as a writing instruction manual, but that is really more of Anne Lamott’s life. I pursued Lamott through Traveling Mercies, a book about her unexpected dive into Christian spirituality, and continued through Plan B and Grace (Eventually), a succession of essays, mostly about Lamott’s faith. I wandered along with Lamott when I discovered she also wrote fiction, but I soon realized that I liked Lamott as a nonfiction rather than a fiction writer and abandoned that dirt trail. And now here I am, pretty far down the road with Lamott, friends, really, at this point, and here she is, Some Assembly Required, and she has become a grandmother. Her young son, nineteen, has become a father, quite unexpectedly, and Lamott is once again forced to abruptly shift her focus in life to this new child and the new family that has been created around this new life. You can see that I am not going to be able to give you much of an objective view of this book. I like Lamott’s nonfiction, so you can bet that I am going to like this book, too. Lamott tells the story of her son’s journey into fatherhood, and shares her frequent moments of Lamott collapse-of-control during some of the scarier moments, and allows her son and her grandson’s mother to pop in now and then with commentary of their own. It’s a jumble of a book, really, and if you aren’t a Lamott fan or if you haven’t become a grandmother yourself or if you consider yourself to be Pretty Put Together most of the time, well, Lamott might get on your nerves a bit…Lamott can be pretty crazy at times. On the other hand, if you have loved Lamott in the past, I think you will find it in yourself to forgive her lapses that pop up in this book now and then and you will love this book too. A sweet, careful gem of a book, I believe it's a worthy read for any grandparent. Anne Lamott is honest about her neuroses and shortcomings, and the reliance she puts on faith to help see her through the unexpected pregnancy of her young son's girlfriend and their joint efforts to raise and love the baby. Most importantly, she accepts great personal responsibility for how she chooses to behave, an inspirational trait for any circumstance, and tries to be understanding of others' personal motivat A sweet, careful gem of a book, I believe it's a worthy read for any grandparent. Anne Lamott is honest about her neuroses and shortcomings, and the reliance she puts on faith to help see her through the unexpected pregnancy of her young son's girlfriend and their joint efforts to raise and love the baby. Most importantly, she accepts great personal responsibility for how she chooses to behave, an inspirational trait for any circumstance, and tries to be understanding of others' personal motivations. I didn't necessarily agree with some of what she did -- mostly, I think, due to a generational gap -- but it's like when a good friend does something you wouldn't do but probably won't lead her to any real harm, e.g. name her kid something God-awful, i.e. none of my damn business. And that's the real message of the book to grandparents, that sometimes, maybe even a lot of times, you have to step back and just let your kids raise their kids. 1. "The job of a good parent is to be dispensable... It's not morally right to make yourself indispensable." 2. "I have tried to accept for twenty years that [my son] is not an extension of me, that children have their own autonomous existence, and that parents have the moral obligation to help them discover this." I'd never read any of Ms Lamott's work before this book, but had heard good things. Her writing isn't the most lyrical, but the plain-spoken fashion of her prose makes it that much more accessible. She is definitely an author worthy of a wide audience, and I'm glad I finally got to know that first-hand. I love Lamott's honesty, particularly her refusal to hide or gloss over moments of insecurity and selfishness. Her voice is beautifully, gloriously human. But I have mixed feelings about this book. This text felt more emotionally distant than her other books, perhaps because the most pressing conflicts are between her son and his girlfriend, and her Great Challenge is learning NOT to get involved in the conflicts. While refraining from action is a very difficult thing to do in life, it does not I love Lamott's honesty, particularly her refusal to hide or gloss over moments of insecurity and selfishness. Her voice is beautifully, gloriously human. But I have mixed feelings about this book. This text felt more emotionally distant than her other books, perhaps because the most pressing conflicts are between her son and his girlfriend, and her Great Challenge is learning NOT to get involved in the conflicts. While refraining from action is a very difficult thing to do in life, it does not make for great storytelling, and left me unfulfilled (that is, I WANT her to step in and maybe smack them both, and tell them to grow up and get a job, and stop whining about how difficult it is to go to school full-time and have a baby; probably because I have friends who are BOTH going to school full-time, raising a family, and supporting themselves, rather than expecting their parents to pay rent and bills and jaunting cross-country for weeks at a time for fun.) I applaud Sam & Amy's attempts to work through their tumultuous relationship, but it often feels like they AREN'T trying. I think this book just stressed me out, and Ms. Lamott conquering her desire to meddle stressed me out more. Also, I sometimes suspected that she was holding back her true feelings from the readers--particularly regarding her grandson's mother. I believe that the author truly loves her daughter-in-law, but she never says anything bad about her or describes feeling genuinely negatively towards her. This may be to protect her current relationship with Amy, but it smacks of dishonesty. Or maybe she never feels anything awful towards Amy, and I am projecting my horrible self onto the situation. In the interests of full disclosure, I received a giveaway copy of this book via Goodreads, AND Operating Instructions is one of my all-time favorite books. On that note, I liked this book, but I wanted to love it. Since Operating Instructions, I've developed a love-hate relationship with Lamott's authorial voice. When she nails it, oh, does she nail it, but sometimes she's just so....herself (as she would admit). Her 19 year old son and his girlfriend have a baby, and echoes of her memoir of sin In the interests of full disclosure, I received a giveaway copy of this book via Goodreads, AND Operating Instructions is one of my all-time favorite books. On that note, I liked this book, but I wanted to love it. Since Operating Instructions, I've developed a love-hate relationship with Lamott's authorial voice. When she nails it, oh, does she nail it, but sometimes she's just so....herself (as she would admit). Her 19 year old son and his girlfriend have a baby, and echoes of her memoir of single motherhood--as part of a nurturing tribe--follow. Jax, the baby in question, is a charmer. Reading about the turbulent relationship between the young parents perhaps should have had me rooting for them, but mostly I felt consternation. Lamott's son, credited as a co-author, is interviewed throughout the book, and his voice sounds eerily like hers. Nature, nurture, or editing? It's hard to review the book without it sounding like a review of Anne. I love that she's so upfront about her foibles, yet mostly able to forgive herself. But there was a point, when she became completely pissed off that the baby was baptized in his mother's childhood church, instead of Lamott's, that made me squirm. I also love that she takes God both seriously, and lightly. Yet her priest friend's respectfully quoted assessment of Advent hit such a false note: "the church strives in Advent to make a large deal out of a fairly small idea....bland, tedious, and empty." Seriously? a joyful season of waiting for a baby to be born and God to become human, and she, of all people, missed it? I'm really not sure what star rating to give this book. I would say that about 70% of it I ADORED - and when I started it, I really thought I was going to love the whole thing unconditionally. About 15% of the book, though, especially in the travel sections (as she spends time on vacation in different parts of the world), didn't seem to particularly fit the rest of the book, thematically - and the section in India, in particular, I found kind of painful. It really felt like it was taking a LONG t I'm really not sure what star rating to give this book. I would say that about 70% of it I ADORED - and when I started it, I really thought I was going to love the whole thing unconditionally. About 15% of the book, though, especially in the travel sections (as she spends time on vacation in different parts of the world), didn't seem to particularly fit the rest of the book, thematically - and the section in India, in particular, I found kind of painful. It really felt like it was taking a LONG time to read, filled with exoticism and Lamott trying to understand the spiritual nature of an entire country in a two-week trip, based on nothing but her own observations and the feedback of an American traveling companion (who'd spent a lot of time in India, but still). Honestly, that section would get a really low rating from me. There was also one particular joke earlier in the book that was so carelessly ethnically insensitive (about gypsies) that I cringed and couldn't enjoy that (otherwise excellent) section of the book nearly as much as I would have otherwise. There's a beautiful clarity to Anne Lamott's writing, when she's writing about herself and her family and circle of friends. There's something about the way she lays out her insecurities and neuroses so clearly that makes her writing incredibly relate-able and life-affirming, even for someone like me who doesn't share a lot of her personal interests or religious outlook. She's also really, really funny and wry in her descriptions of interactions with the people she loves, especially when they go really awkwardly. The way she describes her fluctuating relationship with her daughter-in-law is just gorgeously human and relatable, and she writes so well that I could see and sympathize with both sides perfectly, even when they were fighting. And as a parent, I just genuinely enjoyed reading about her grandson growing through his first year, described in loving detail. There were parts of this book that I didn't even like a bit, but then I absolutely loved over half of it - and I'll definitely come back to it again in the future, when I have grandchildren of my own. Anne Lamott is like Dumbledore of spiritual life writing. When I read her books, I recognize a very similar flavor of my own particular brand of crazy. I hear the neurotic things I say to myself in my own head all the time and that alone is comforting: To read your own crazy mind outside of your own crazy mind. But Anne Lamott has been crazy for a little longer and she is lot better at it than I am. She also has some peace and perspective that I can’t quite get to when left to my own devices. She doesn’t take herself very seriously and this is a huge step to stopping the crazy train. She has humor and tenderness and wisdom and acceptance of herself that makes her neurosis seem soft and pliable, whereas inside my own head I feel like I’m just doomed and probably going to be committed any day now. So I see a picture of myself, but it's bathed in hope and faith rather than angst and self-loathing. It’s like someone is looking over my shoulder when I’m in a crazy-making space and is very kindly and gently suggesting something simple and obvious to bring back down to earth. I wanted to love this book. I love Anne Lamott--her self-deprecating humor, her love for Jesus, her body issues. I love seeing her in person when she does readings of her books. But I just don't like this book. She's supposedly struggling with her son becoming a father at a very young age but I'm not sure there was much of a struggle nice she fell in love with young Jax the second he was born. The biggest struggle seems to be to keep her mouth shut. And I know from personal experience that chall I wanted to love this book. I love Anne Lamott--her self-deprecating humor, her love for Jesus, her body issues. I love seeing her in person when she does readings of her books. But I just don't like this book. She's supposedly struggling with her son becoming a father at a very young age but I'm not sure there was much of a struggle nice she fell in love with young Jax the second he was born. The biggest struggle seems to be to keep her mouth shut. And I know from personal experience that challenge, but it's hardly enough to write a book about. This is what I agree with Anne Lamott about- being a grandparent is the best thing in the world. It is a job that only requires you love another person unconditionally. You are not responsible for them. You don't have to discipline them, give them guidelines and boundaries. Your only job is to love them and give them a safe haven. That being said, I could not live in my child's pocket the way she does. Is it because it was just her and her son? I had four children so I would have completely los This is what I agree with Anne Lamott about- being a grandparent is the best thing in the world. It is a job that only requires you love another person unconditionally. You are not responsible for them. You don't have to discipline them, give them guidelines and boundaries. Your only job is to love them and give them a safe haven. That being said, I could not live in my child's pocket the way she does. Is it because it was just her and her son? I had four children so I would have completely lost my mind trying to micromanage them the way she does her only son. I can understand she had real and valid concerns for her son, Sam, becoming a father at 20 but she just goes too far. As the memoir goes on, I grow to dislike her a little. She lets his life overtake hers. There were many examples of her trying to bribe the children to stay close to her. She interviews them which would really have put me off. When the mother takes the grandchild to visit her family, Lamott quizzes her son about how she expects the child to have changed in his absence. Please give him a chance to breath. I won this book through "Goodreads" but am sad to say that the excitement ended shortly after this book arrived at my doorstep. I have to be honest that I lost steam midway through. I really enjoy reading about different characters, learning to see the I won this book through "Goodreads" but am sad to say that the excitement ended shortly after this book arrived at my doorstep. If you're hoping for another Operating Instructions experience this is not it. Classic Lamott-isms but this story is not hers to tell - it belongs to her son and his girlfriend. Heard Lamott speak last week where she revealed that her publisher was responsible for pushing the idea of this book which she initially turned down because she thought it would be "exploitative" - she was right and should have stuck to her guns. I come to Anne Lamott as a fan and faithful reader. Her past books have been mordantly funny and self-deprecating. She recognized her self-absorption, and seemed to have built herself a great network of friends who would willingly, gently puncture her self-absorption. This book disappointed me in so many ways. Her black-humored self-absorption seems in this book to have turned into epic narcissism. And yet she's self-aware enough to recognize it as narcissism and offer I come to Anne Lamott as a fan and faithful reader. Her past books have been mordantly funny and self-deprecating. She recognized her self-absorption, and seemed to have built herself a great network of friends who would willingly, gently puncture her self-absorption. This book disappointed me in so many ways. Her black-humored self-absorption seems in this book to have turned into epic narcissism. And yet she's self-aware enough to recognize it as narcissism and offer a tossed-off recovery cliche or Jesus thingy at the end of yet another story of her own bad behavior, as if that makes it okay. What really made me infuriated while reading this is that she has apparently made her son a hostage to her neediness and self-interest. That he goes along with it is just sad. He's got Stockholm Syndrome, bad. I hope he has a very, very good therapist on speed dial. Throughout, she tries (subtly, and not-so-subtly) to paint Amy (her grandson's mother) as a monster of selfishness for -- oh my god -- wanting her son to know his mother's family, for traveling with him to another part of the country. How DARE Amy want to be with her family? How DARE she do what she sees fit to do for her own child and deprive saintly Anne of this infant's company? Frankly, Amy comes off better in this book than Lamott herself does. Look, I get it. Anne Lamott's earlier memoirs of child-rearing were funny and touching and real. She's pretty much the only Christian I can stand to read (Frank Schaefer is another). But Sam is a grown-up now, and she needs to stop milking his story and making it all about her. Let's get this straight: this wasn't a journal of her son's first son. This was a journal of neuroses, mostly of becoming a grandmother, but also of controlling others' lives and trying to keep that patter tamped down as best she could. I might have been charmed had I not read it as a mother with young children myself, which put me in a different perspective. I read Operating Instructions a bit before I was pregnant with #1 and appreciated it, and now I'm reading this a bit before I have #2 and a Let's get this straight: this wasn't a journal of her son's first son. This was a journal of neuroses, mostly of becoming a grandmother, but also of controlling others' lives and trying to keep that patter tamped down as best she could. I might have been charmed had I not read it as a mother with young children myself, which put me in a different perspective. I read Operating Instructions a bit before I was pregnant with #1 and appreciated it, and now I'm reading this a bit before I have #2 and all I can think is: I am so grateful my mother and mother-in-law are not like this. Or, if they are, they have the wonderful grace to keep it to themselves and support me and my husband fully in the parenting choices we make, foolish or not. Impossible to put down. Lamott writes clearly, beautifully, with self-deprecation, humor and raw, painful honesty. She does not sugarcoat or idealize, ever, but she is attuned to the beauty of the divine leaking through this messed-up world. The crossroads between these two makes for a vision of heavenly grace stripped of sentimentality, which is to say, heavenly grace. Reading her accounts of the heartbreakingly lovely quotidian makes me more attuned to the little blessings in my own life. "Nat Impossible to put down. Lamott writes clearly, beautifully, with self-deprecation, humor and raw, painful honesty. She does not sugarcoat or idealize, ever, but she is attuned to the beauty of the divine leaking through this messed-up world. The crossroads between these two makes for a vision of heavenly grace stripped of sentimentality, which is to say, heavenly grace. Reading her accounts of the heartbreakingly lovely quotidian makes me more attuned to the little blessings in my own life. "Nature is the greatest solace," she writes, and I would add people close behind. I also enjoyed the way this book is structured. Anne's own reflections are interspersed with phone interviews with her son, emails from her daughter-in-law and son, and interactions with sundry friends. It's certainly changed the way I think about what comprises a "journal," and I can't wait to include excerpts from texts, emails, and reviews like this in my own journal. I listened to this book on audio read by the author (with snippets from her son Son) writes about the complex feelings that Jax fosters in her, recalling her own experiences with Sam when she was a single mother. Over the course of the year, t In Some Assembly Required, Anne Lamott enters a new and unexpected chapter of her own life: grandmotherhood. I listened to this book on audio read by the author (with snippets from her son Son) writes about the complex feelings that Jax fosters in her, recalling her own experiences with Sam when she was a single mother. Over the course of the year, the rhythms of life, death, family, and friends unfold in surprising and joyful ways. I am not overly familiar with Anne Lamott but her voice is one of the most authentic and true voices I have heard in a long time. She has a brutal honesty about herself and her life that is both self-depreciating, and genuine;all told with a wicked sense of humor. I could have done without the over thinking and the overindulgence of the greatness of Jax told ad nauseum by Sam. What parent doesn’t think their baby is the second coming but some things are left better unsaid. Or at least not said over and over. I just love Anne Lamott! She's one of my favorite writers. I always enjoy her nonfiction work much more than her fiction, and I always recommend listening to her books read by her. This book deals with her son Sam's becoming a father, while still just a teenager himself, and her becoming a grandmother at an unexpectedly early age. Well, needless to say, she falls in love with her new grandson Jax at first sight. Then comes the challenge of letting her son and his girlfriend parent the new baby w I just love Anne Lamott! She's one of my favorite writers. I always enjoy her nonfiction work much more than her fiction, and I always recommend listening to her books read by her. I'm a big fan of Lamott's non-fiction and this did not disappoint. I particularly like how she lays out all her petty, messy little thoughts that we ALL have, but don't necessarily act upon. She's sarcastic, witty and profound. "so we breathe in, and out, talk to friends as needed. We show up, wear clean underwear, say hello to strangers. We plant bu I'm a big fan of Lamott's non-fiction and this did not disappoint. I particularly like how she lays out all her petty, messy little thoughts that we ALL have, but don't necessarily act upon. She's sarcastic, witty and profound. "so we breathe in, and out, talk to friends as needed. We show up, wear clean underwear, say hello to strangers. We plant bulbs, and pick up litter, knowing there will be more in twenty minutes. We pray that we might cooperate with ANY flicker of light we can find in the world." I picked up this book because, like the author, my 20 year old son unexpectedly became a father and his son is almost a year old now. I thought it would be interesting to read about her experience as a grandmother and the first year of her grandson's life, but it was more like a journal about her. It is interestingly written, but there were whole chapters about her trips to Europe and India which I felt were kind of self centered and irrelevant. I have not read her earlier books, one of which wa I picked up this book because, like the author, my 20 year old son unexpectedly became a father and his son is almost a year old now. I thought it would be interesting to read about her experience as a grandmother and the first year of her grandson's life, but it was more like a journal about her. It is interestingly written, but there were whole chapters about her trips to Europe and India which I felt were kind of self centered and irrelevant. I have not read her earlier books, one of which was her experience as a single mother, so I guess I expected something different. Wonderful. I always love Anne Lamott. I love Anne Lamott's books, and I think my favorite so far was Operating Instructions, a journal of her son's first year. This book is a journal of this son's son's first year...her grandson't first year. She fills it with Jax, the grandson, interviews with Sam, her son, and observations from Amy, Jax's mom. My husband David is away, taking care of his dad in California. So I am alone and have room to be loving and generous; it's pretty easy when I'm not called on to be genuinely, actually eithe I love Anne Lamott's books, and I think my favorite so far was Operating Instructions, a journal of her son's first year. This book is a journal of this son's son's first year...her grandson't first year. She fills it with Jax, the grandson, interviews with Sam, her son, and observations from Amy, Jax's mom. My husband David is away, taking care of his dad in California. So I am alone and have room to be loving and generous; it's pretty easy when I'm not called on to be genuinely, actually either loving or generous. Anne Lamott's book makes me think I could actually be this way with David in the house, or while teaching in Middle School. I love her writing. She is so funny and self-deprecating and she undercuts her self-deprecation by being utterly wonderful but not talking much about that. Lamott is also an amazing explainer of everything--not just family life. Near the end of the book she's visiting Helsinki with a her good friend Tom and she's describing how the Greek Orthodox and Latin church got into a huge fight because the Latin church wanted to change their "Creed" and say the Holy Spirit proceeds from the Father and the Son. The Greek Orthodox Church said this was heretical. The Holy Spirit proceeds from the Father, end of story. Anne writes, " The Greek Orthodox Church maintained that this was change, therefore heretical. The latin Church thought of it as clarification. Everyone became fanatical, and if you disagreed with other people's understanding, then they got to kill you. This is all very modern, very Sarah Palin." And the way she writes about wanting to change Sam and Amy so that they are kinder to each other, don't argue in front of Jax, be who she wants them to be...well, duh, isn't that being human is? Doesn't each of us want to set the agenda, in teacher terms, "the goals for the year" and wouldn't everyone be smart just to go along and work for that A? I want everyone who is a new mother or grandmother, or father or grandfather to read this book. I have friends I know will love it so I am telling them I will buy it for them and they are saying they will get it themselves. And I guess that's Lamott's point. I can try to make everyone read and love this book as much as I do, or I can mention that I am loving it and let them read it or not. I read a library copy and now I am going to buy it (or wait for the paperback) and read it when I need to, which is pretty often, so I can remind myself of how I felt as I saw myself in her stories. I can't help but end by saying, "You really ought to read it. I don't know anyone who wouldn't see themselves in Anne. Or maybe, I don't know anyone who ought to see themselves in Anne ...even if they aren't yet able to. i loved anne lamott's operating instructions. it's one of my favorite books about being a new parent. i was hoping that this book would recapture some of that same magic. it purports to be a diary-style memoir of her grandson's first year of life. lamott's son sam took up with a lady & fathered a child with her at the tender age of twenty. due to the young age of the parents & lamott's tight single mom/only child relationship with her on, of course she was going to be as heavily involved i loved anne lamott's operating instructions. it's one of my favorite books about being a new parent. i was hoping that this book would recapture some of that same magic. it purports to be a diary-style memoir of her grandson's first year of life. lamott's son sam took up with a lady & fathered a child with her at the tender age of twenty. due to the young age of the parents & lamott's tight single mom/only child relationship with her on, of course she was going to be as heavily involved with the baby's life as possible. it was a pleasant enough read, but ultimately, nothing too special. there's something about reading a grandmother gusing about her grandbaby that just doesn't have the same magic as reading about a mother discovering motherhood. & i think that i find lamott's narrative voice wearying now that i am a little older & set in my ways. this is more of the same: lamott has so many friends & goes to church all the time & her relationship with god is so affirming & did you know she used to be an alcoholic & oh how she struggles with relinquishing control, etc etc etc. the confessional aspects that i found so appealing when i was in my 20s really grate on me now. it feels like the airing of dirty laundry, mixed with a soupcon of annoying humblebrag. I love Anne Lamott's writing, and she's almost exactly my age, so it was interesting to see how she's navigating the grandmotherly waters. She's so self-effacing and flat-out hilarious, but to be honest, this wasn't my fave Lamott book. She's kind of meddlesome! Okay, this is her first grandbaby of her only child, and the kids are really young. Way too young to be parents. It would be hard to find the middle ground between trying to support them and stay the heck out of their biz. Rough balancin I love Anne Lamott's writing, and she's almost exactly my age, so it was interesting to see how she's navigating the grandmotherly waters. She's so self-effacing and flat-out hilarious, but to be honest, this wasn't my fave Lamott book. She's kind of meddlesome! Okay, this is her first grandbaby of her only child, and the kids are really young. Way too young to be parents. It would be hard to find the middle ground between trying to support them and stay the heck out of their biz. Rough balancing act. But I sense heartache on the horizon. I wasn't sure why she included the trip to India. It's almost out of context from the rest of the book. But you can't read Lamott without gaining some wisdom about human nature. Here's a gem: the idea of "tending to one's own emotional acre." Here's another: As a grandma I'm constantly going back and forth between feeling like I'm growing an umbilical cord to my son's family (the babies, not him), and then guilty for running off and living my awesome carefree grownup life. Anne dealt with that dichotomy too. She writes, "I had no choice but to (live my life). It's always the same old problem: how to find ourSELVES in the great yammering of ego and tragedy and discomfort and obsession with everyone else's destinies."